Why a Fitness Update on a Bipolar Blog? Over 80 percent of people with serious mental illnesses, such as schizophrenia, bipolar disorder and major depression, are overweight or obese. Much of this has to do with medicines that reduce the metabolism. This contributes to them dying at three times the rate of overall population. Therefore, I have begun this weekly fitness update for motivation. Motivation for those of you out there struggling with weight, and more specifically, motivating me. I’m in shock. Last week I lost 3.8 lbs and this week I gained 4.0 lbs. 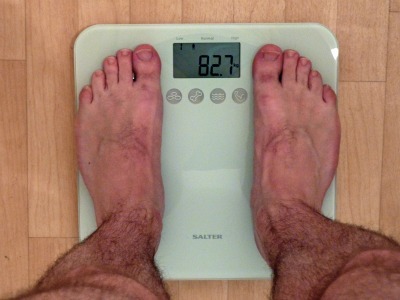 I’ve been hovering at this weight for a long time now. When will this yoyo stop? I didn’t get as much exercise as I have in past weeks, but I also refrained from going over my daily allotment. The only thing that makes sense to me is that Maurice and I went out to eat the night before weight in. Though most of the food was healthy vegetables, I ate a lot of it. In addition there is the sodium factor, which was included in the food. I hate to make excuses, but that’s the only thing that makes sense. I’m anxious to see how it goes this week. I use to have very severe water retention problems until my pdoc changed my meds. Unfortunately it still happens occasionally, but nearly as much as before. ty to both of you. well, its like you have said before bradley–we often have ‘complex’ issues, ie our mental health issues or meds can influence so many other things…like our weight. sometimes, i guess we just have to make priority choices and let the other things go. I’m so sorry Kat. I can “hear” how discouraged you are. I hope you and your doctors can get it straightened out soon. I’m sorry you’re not seeing results, kat, I know it’s beyond frustrating. I hope you’ll find something that works for you soon. I totally agree with you about the sodium content when eating out. Restaurants use a lot of salt in their cooking. I use little to none. I figure we can salt our own plates to our own taste. I got into this habit when my mother in law was alive–she was on a low sodium diet so I just stuck with it even when she wasn’t visiting. When we go out–even if I order healthy and save 1/2 the food to take home, order pizza or take home Chinese food (again saving 1/2 for another day), it’s inevitable I gain a couple of pounds. It’s usually mostly or all water retention. Perhaps that’s what you are experiencing. And perhaps you have hit what they call a plateau and the body needs to readjust. Getting focused, strict, again will eventually yield the results, I’m sure of it. You can do it, Bradley. Your following is rooting for you.